Cherry Squares take us back in time - back to the 1960s. As a child these Cherry Squares were one of my favorite desserts. I just loved the sweet and grainy graham cracker crust, the soft and creamy marshmallow filling and the juicy sweet 'canned' red cherries. Now you may say "why use canned cherries when fresh are so much better"? The answer lies in the fact that this recipe comes from a time when instant foods were quite new and popular. Cake mixes, canned fruits, and instant puddings were welcomed by some who didn't want to spend hours preparing desserts from scratch. Instant foods allowed them to get in and out of the kitchen quickly. My mother seemed to embrace both her and her mother's generation. On the one hand she would make her own bread and bake us cookies from scratch. On the other hand, she would sometimes make cakes using boxed mixes and make desserts such as these Cherry Squares that would combine both homemade with instant. Today I still make Cherry Squares the same way as my mother, although sometimes I like to replace 1/2 cup (120 ml) of the graham cracker crumbs with crushed gingersnap cookies. And if I am ambitious I will substitute homemade marshmallows for the packaged variety. But I still love how these squares taste and how they bring back fond memories. So, what is Cherry Pie Filling? It is a canned mixture of sweet red pitted cherries packed in sweetened water and thickened with cornstarch (corn flour). This recipe uses a 21 ounce (595 grams) can. But don't feel you have to use cherry pie filling. I often top the squares with a medley of fresh berries, or fruit sauces (strawberry, raspberry, or blueberry), or even a delicious chocolate sauce. Cherry Squares: Butter, or spray with a non-stick vegetable spray, a 9 inch (23 cm) square baking pan. Graham Cracker Crust: In a medium-sized bowl combine the graham cracker crumbs, sugar, and melted butter. Remove about 2/3 cup (80 grams) of the crumbs, cover, and set aside to be used as a garnish. Press the remaining crumb mixture evenly over the bottom of the prepared pan. Cover with plastic wrap and place in the refrigerator to firm up while you make the filling. Marshmallow Filling: Place your mixing bowl and wire whisk in the freezer for about 15 minutes. Then put the cold cream, sugar, and vanilla extract in the cold bowl and beat until soft peaks form. Fold in the miniature marshmallows. Pour the filling over the graham cracker base and smooth the top. Cover and place in the refrigerator for three to four hours, or even overnight. To serve, use a sharp knife and cut into squares. 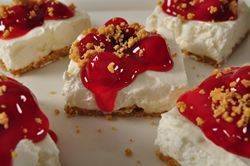 Place a large dollop of cherry pie filling on each square and sprinkle with some of the remaining graham cracker crumbs. Leftovers can be covered and stored in the refrigerator for three to four days. Makes about 16 - 2 inch (5 cm) squares. Preparation time 45 minutes.